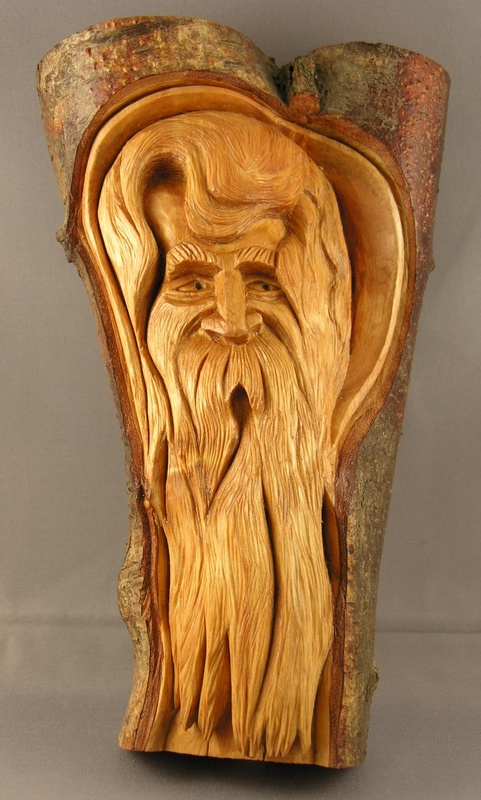 A description of my journey learning to carve caricatures and wood spirits. First in class at the Sussex Woodcraft Society www.sussexwoodcraft.co.uk 2012 Annual show. This was carved in wet Silver Birch, the tree having been cut 2 months before work commenced. Drying checks (cracks) were avoided by flattening and grooving the back of the log with a chainsaw to equalize the shrinkage stress between front and back (heartwood and sap wood). Carving emphasis was placed on framing the image by a surround of deep cuts to create shadows, all done with a scarey sharp knife. Rennaissance wax was developed for the British Museum to preserve all it's antiquities. It dries hard and is resistant to finger marking. An interest in wood for over 60 years involving boat and rod building, turning, carving, restoration, pyrography, ecology, palaeoecology, palynology, oil and gas exploration.